As owner/operators, we spend a lot of time and resources promoting birthday parties, but results sometimes fall short. So what tools make it easy to implement online strategies to book more parties? This free tool kit is your guide to everything you need to get started. Whether you're just getting started or looking to improve effectiveness of your current efforts, this tool kit will help you drive the best possible results. A handy checklist to help convert website visitors into party bookings. A step-by-step guide to planning and creating Facebook ads for birthday parties. 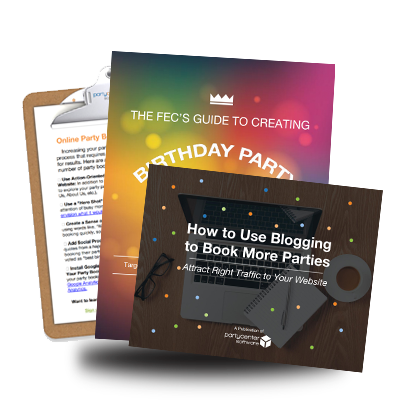 An ebook on How to Use Blogging to Book More Parties. Are you ready to increase online party bookings? Simply fill out the form to gain immediate access the tool kit!